I replaced the hard drive in my MacBook today with a new 200GB, 7200RPM, Hitachi Travelstar™ 7K200. I had read several reviews, all favourable, and supposedly it doesn't use much more power, or get much warmer, than the stock Toshiba 80GB. I use VMWare Fusion to run an XP VM and an OpenSolaris VM, so the 74GB on the stock drive wasn't cutting it. I ordered the new one from MacSales and picked up a Newer Technology USB 2.0 Universal Drive Adapter at the same time; it lets you hook up just about any bare drive to a PC or Mac via USB 2.0. 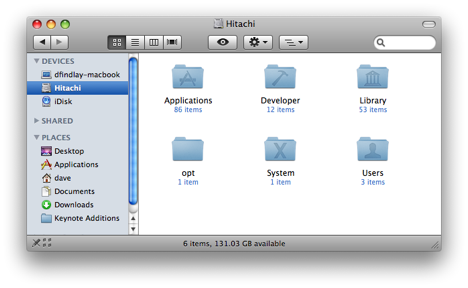 I hooked up the new Hitachi via the adapter and used Disk Utility to create a single 185.99GB partition. I set it up with 'GUID Partition Table' as the Partition Map Scheme, since that's required on Intel Macs for boot volumes. I then had SuperDuper make a bootable image of my existing hard drive, which took a couple of hours. Once I had that, I rebooted while holding down Option so that it would let me choose a boot volume on boot. The Hitachi showed up - a good sign - and I selected it. It came up, I logged in, and everything looked good, so I shut it back down and proceeded to swap the drive out. Fortunately Apple makes this about as painless as it could possibly be; providing you follow common-sense precautions for ESD you shouldn't have any trouble. I printed out the instructions at MacInstruct and headed over to our hardware lab at work, since it has copious amounts of static-mat-covered workbenches and the Torx T8 you need to get the shield off the old drive. 10 minutes later I was up and running on the new drive. I should have named the new drive 'Macintosh HD' to match the old one, but I didn't and both Time Machine and Spotlight got a bit excited when I booted up. But my old Time Machine drive isn't going to be big enough for long, and I don't need any of the history that's on it anyway, so this wasn't a big deal for me. I'll report back on whether the RPM bump affects battery life and performance.